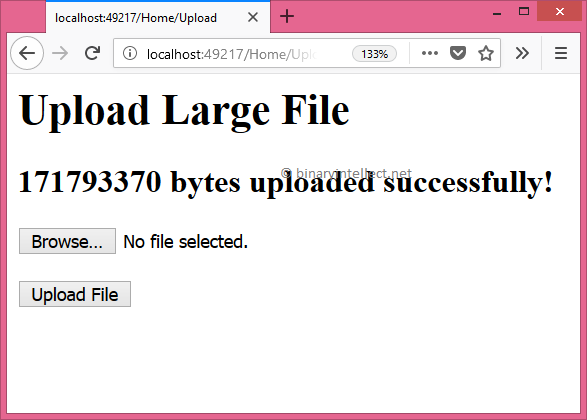 By default, ASP.NET Core allows you to upload files up to 28 MB (approximately) in size. 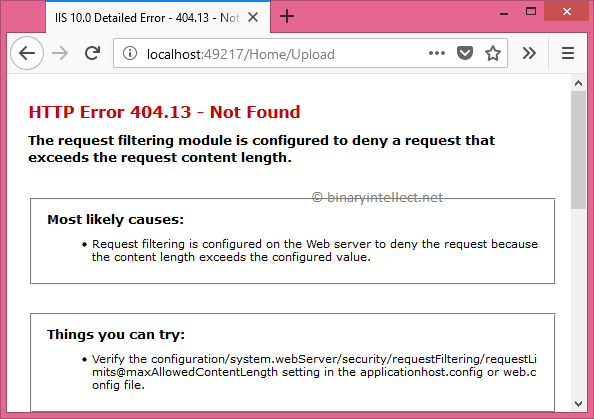 However, at times you want to deviate from this limit and upload larger files on the server. To raise this limit you need to make a couple of additions to your code. And there are a few variations of how that can be done. To that end this article discusses these possible approaches to upload large files. Notice that the enctype attribute of the <form> element is set to multipart/form-data since we want to upload a file. 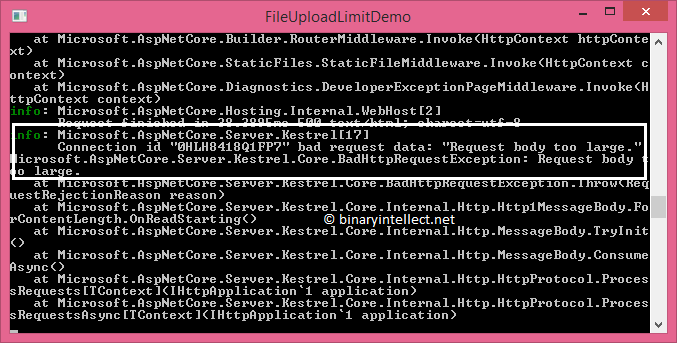 The form POSTs to the Upload() action of the HomeController. I won't go into the details of this code. It basically saves the uploaded file to the wwwroot folder. The uploaded file is received through IFormFile parameter and the IHostingEnvironment is injected in order to compute the physical path of the file. To understand the problem, run the application and try to upload a file with larger size, say 100 MB. 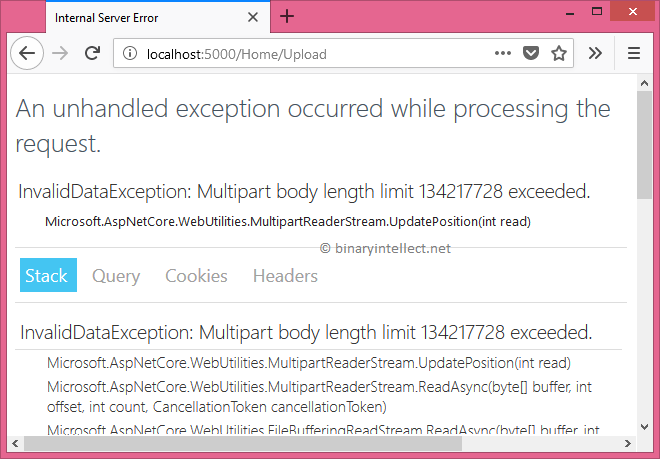 So, depending on whether you are hosting under IIS or Kestrel the solution is going to slightly differ. Let's see how. The requestLimits element's maxAllowedContentLength is set to 200 MB. You can change this limit as per your requirement. This will change the default request length to 200 MB. So, we set the MultipartBodyLengthLimit property of [RequestFormLimits] to 200 MB. Now, run the application again. This time it will happily upload the file. The maxAllowedContentLength attribute of <requestLimits> change the setting for the whole application. What if you don't want that much content length for one or more actions? In that case you can use [RequestSizeLimit] attribute to override the content length limit. This will be clear in the next section because the solution for Kestrel uses it. If you are using Kestrel you have the option to change the request content length settings either at action level or at the application level. If you wish to set these limits for the entire application then modify you you need to modify Program.cs and Startup.cs. The above code sets the MaxRequestBodySize property to 200 MB. The above code configures the FormOptions and sets the MultipartBodyLengthLimit property to 200 MB. If you run the application now, it will allow you to upload larger files without any problem. One more thing before I conclude - there is also [DisableRequestSizeLimit] attribute that disables upper limit on the request size altogether. However, you should use it with caution.